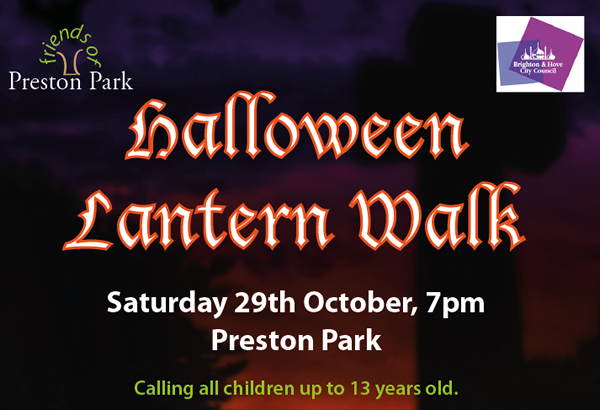 Bring along your own home-made lantern and we’ll take an evening walk around the park to show it off and banish those ogres and witches. If you want, you can come in fancy dress. We’ll give a prize for the best lantern and a prize for the best fancy dress. Meet at the Ladies Bowls pavilion (next to the Rotunda) in Preston Park. We’ll provide light refreshments, hot drinks and activities. If you can, let us know beforehand that you want to come using our contact form or by emailing us at info@friendsofprestonpark.org. we are definatley coming to the lantern walk! We can’t wait !thanks friends of preston park.